Moist. Woods, forests, meadows, stream banks. Light shade to partial sun. 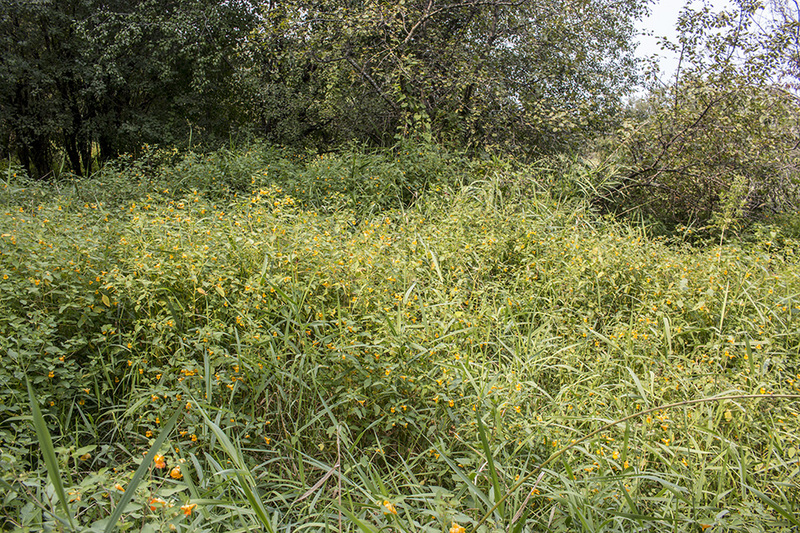 This is a 2′ to 6′ tall, erect, annual forb that rises from a shallow, branching taproot. It often forms colonies. The stems are erect, hairless, branched above the middle, light green to light reddish green, and translucent. They are succulent, hollow, and easily broken. The leaves are alternate, egg-shaped or elliptic, and thin. They are 1″ to 4″ long and up to 2″ wide, less than 3 times longer than wide. They are on leaf stalks up to 2″ long, the stalk usually shorter than the blade. The upper surface is dull green and hairless. The lower surface is hairless. The margins have rounded, forward-pointing teeth. The teeth are tipped with a short, sharp, whitish, abrupt point. The leaves on flowering branches are no more than 3⅛″ long. The inflorescence is a widely-spreading cluster of 1 to 3 flowers rising from the upper leaf axils. 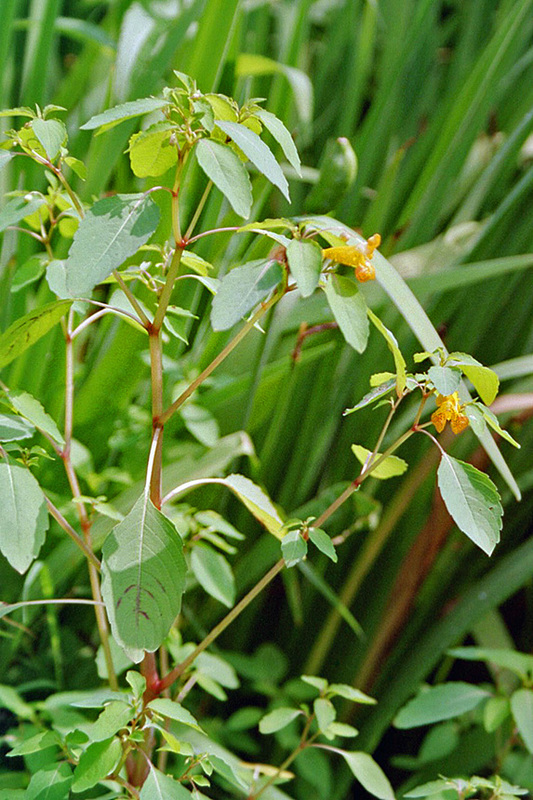 The flowers are held horizontally on ¾″ to 1⅛″ long, drooping stalks. The flowers are ¾″ to 1⅛″ long. 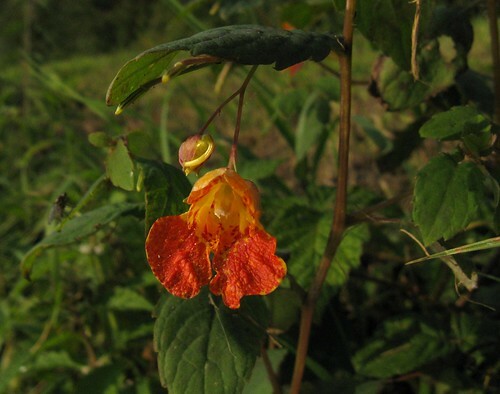 There are 3 petal-like sepals and 5 petals. The upper 2 sepals are light green to light yellow, small, and located behind the upper lip. The lower sepal is light orange and shiny. 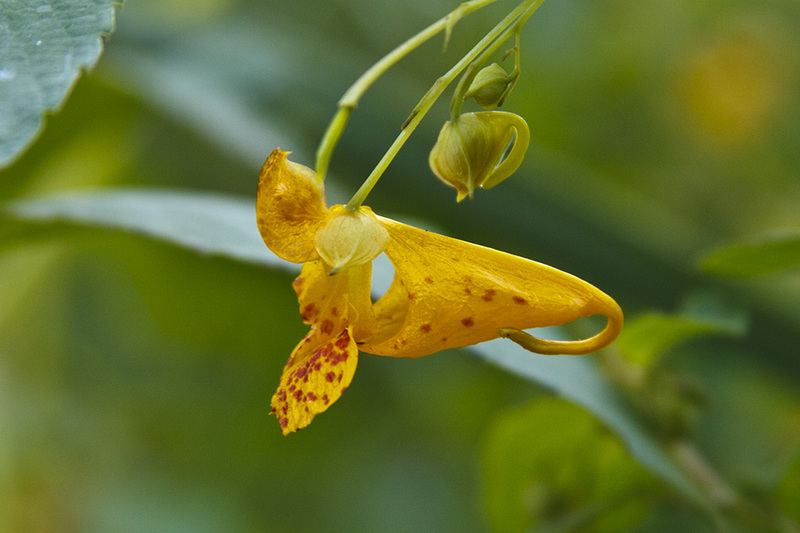 It is modified to form a cone-shaped tube ending in a narrow nectar spur. The cone-shaped portion of the sepal is longer than it is wide. The spur is ¼″ to ⅜″ long, hairless, curved forward, and held close to the body of the flower. 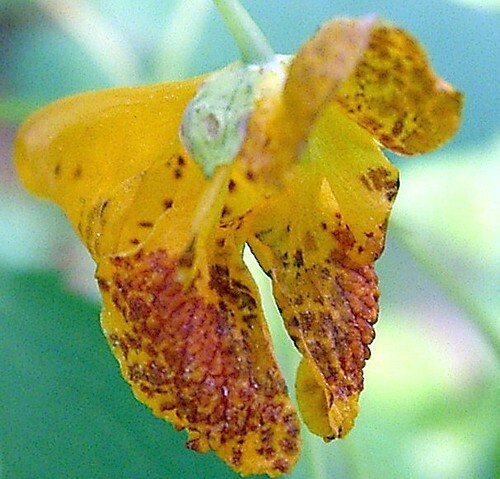 The petals are orange with reddish-brown spots. One petal forms the upper lip. It is short and wide and curves upward. The four remaining petals are fused in pairs to form two lobed, lateral petals. The lobes of these petals spread outwards forming a pair of landing pads for pollinating insects. Near the upper lip are 5 stamens fused together forming a cap over the pistil. There is no floral scent. The fruit is a slender, hairless, 5-valved capsule about ¾″ long. When ripe it explodes if touched or jarred, releasing its seeds. 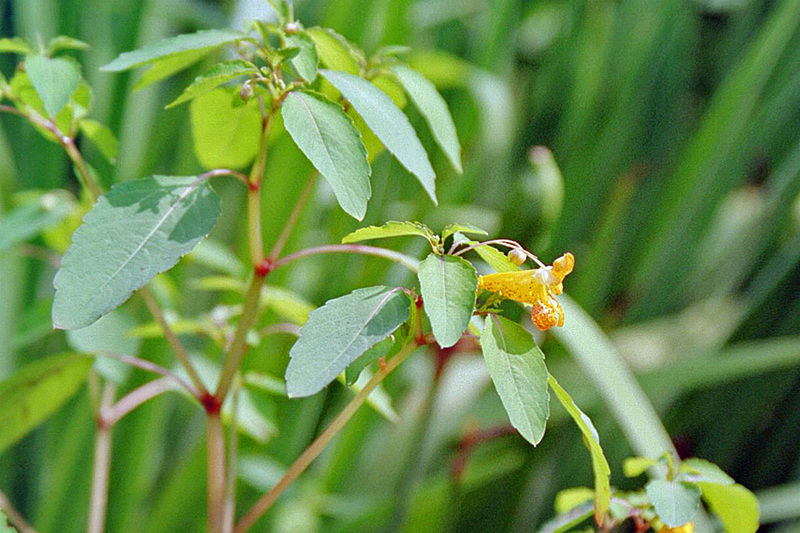 Pale touch-me-not (Impatiens pallida) is usually a larger plant. The leaves on flowering branches are usually more than 3⅛″ long. 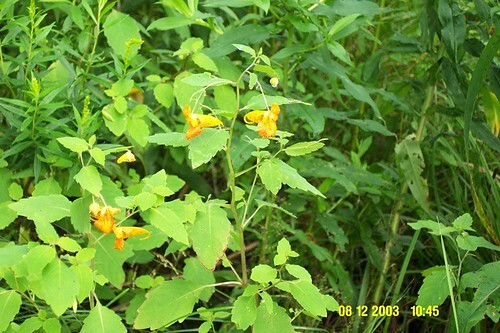 The flowers are larger, 1″ to 1½″ long. The tube formed by the lower sepal is shorter and bowl-shaped, as long as wide. The spur is shorter, ⅛″ to ¼″ long, and is held at a right angle to the flower body, pointing downward. The petals are pale yellow. 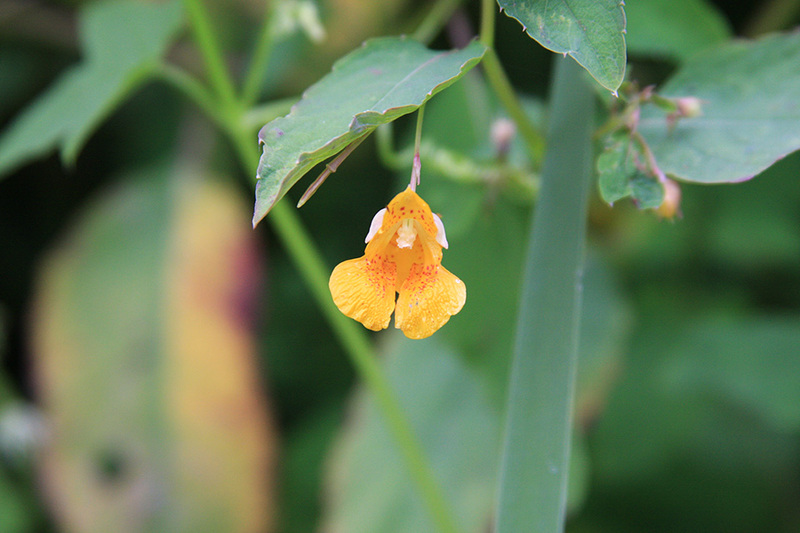 It is less common than spotted touch-me-not and is found in shadier locations. Having thick leaves, stems, or roots that store water. Succulent tissues appear fleshy externally and juicy internally. 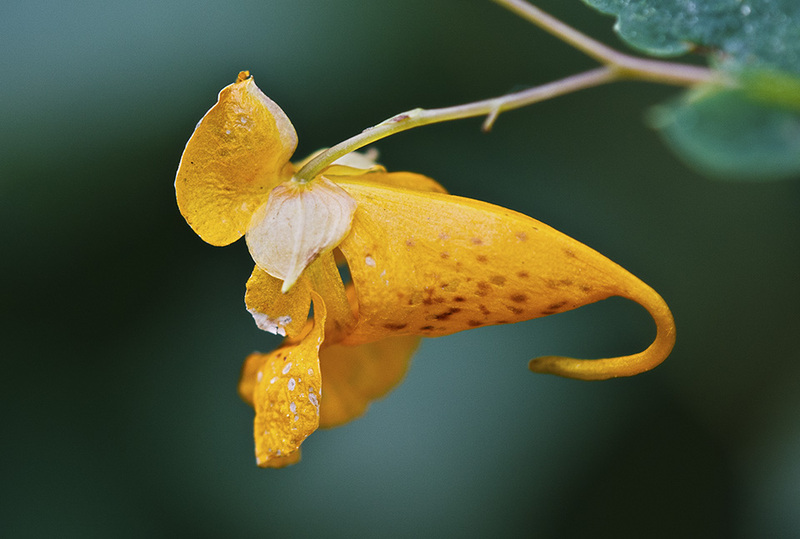 i had only discovered that Spotted Touch-Me-Nots were native to North America and a favorite flower for Hummingbirds. And also this summer i have come to understand how they got their name. With the slightest of pressure on a ready seed pod they exploding shooting seeds in all directions. This plant is not a garden pest/weed! keep it around if you want hummingbirds to visit your yard every year! 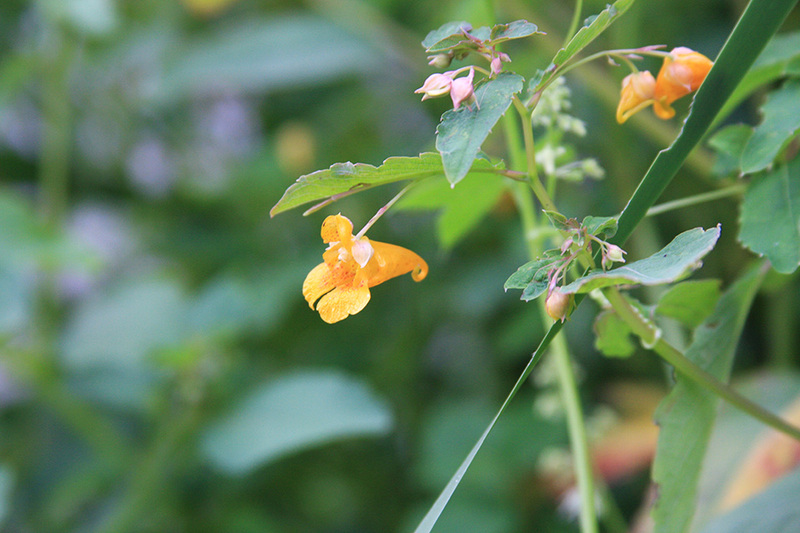 Krik of Black Owl Outdoors highlights a very useful plant found in the forest, Jewelweed or Impatiens capensis. 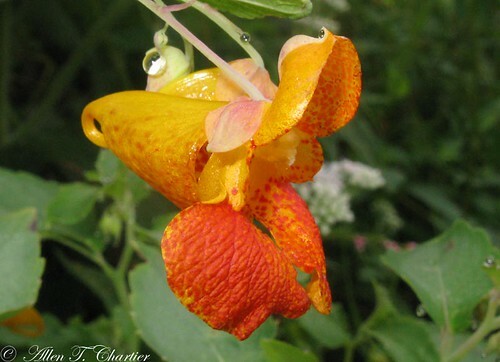 Jewelweed can be used as a topical antidote to poison ivy and relieve the poison ivy's annoying symptoms.